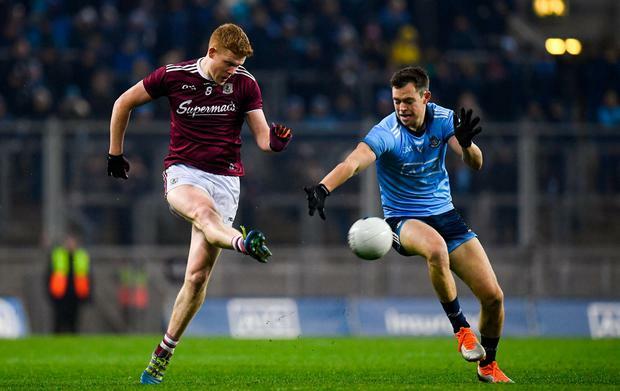 It wasn't so much a phoney war in Croke Park on Saturday night but a frozen skirmish. 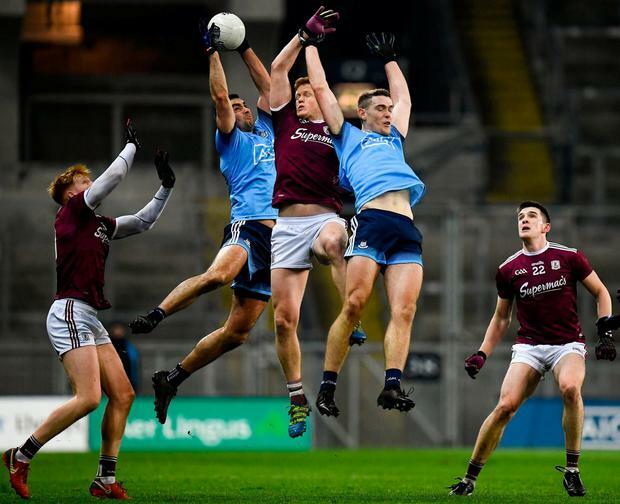 A repeat of last year's league final and one of 2019's All-Ireland semi-finals, there were no markers laid down on Saturday evening or statements made. 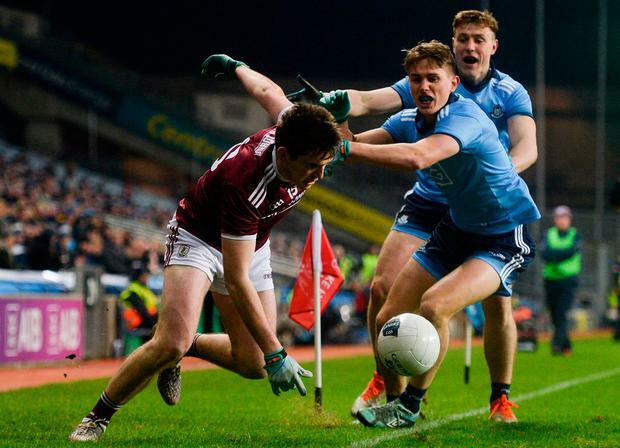 Instead, Dublin and Galway stretched their legs in each other's company and the biting February cold, with the former finding a higher level in the second half thus avoiding back-to-back league defeats for the first time under Jim Gavin. Quite how that level measured up against their exalted standards was difficult to tell but equally, it didn't seem particularly relevant on Saturday. When he managed to coax some warmth back into his bones afterwards, Jim Gavin presented himself for interview and told how his team were "just getting into pre-season" mode. In the context of next Saturday's trip to Tralee, the avoidance of a second consecutive loss was naturally a welcome outcome. "To get two points on the board is important," acknowledged Gavin after his 93rd league or championship match as Dublin manager and a 75th victory. "We were disappointed last week we didn't get anything out of it in terms of the scoreboard but in terms of the workout, it was a really useful exercise." 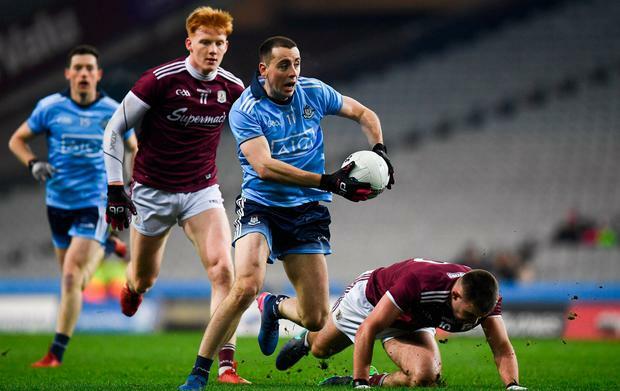 Having nipped ahead at the end of a mutually disappointing first half, Dublin's primacy in the second was reflected in them scoring 1-8 to Galway's 0-2 in the second. "We did very little this week so there was a bit of freshness in the legs today," Gavin explained. In contrast with the previous Sunday's loss in Clones, Gavin fielded four debutants, each with varying degree of success but most warranting further inspection. Undeniably though, the individual performance of the night was Cormac Costello's. 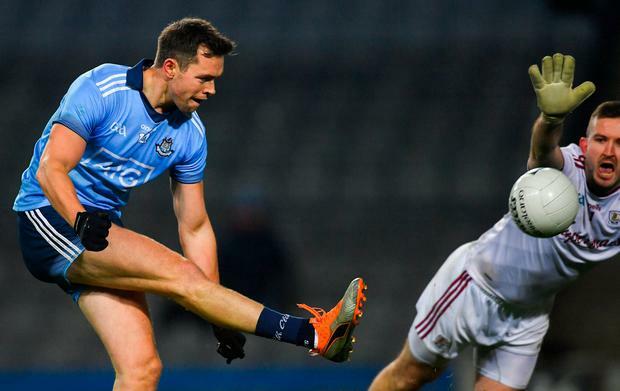 At 24, Costello has been in the Dublin panel since Gavin assumed office in 2013 but a cruel sequence of injury has minimised his appearances, particularly at this unglamorous time of year. On Saturday night, he showed for everything from the pivot of the Dublin attack, running hard from the 'D' and habitually taking his man on. Costello's finishing was crisp, too, and a haul of 0-6, five from play, reflective of a productive evening's work. In each of the last three summers, Gavin has unearthed a new forward to freshen up his starting championship attack. It could be that he doesn't have to dig too deeply for this year's 'find'. "Certainly it benefits a player if he's getting a good run of games in the league to stake a claim for a championship spot," the Dublin manager acknowledged. "That's the form that we'd know from Cormac. First and foremost he's a great team player and does an awful lot of work off the ball for the team." Of greater surprise on the night then was Galway's lack of staying power in the second half. These teams played each other three times last year and each game was flinty and competitive. "We definitely haven't as much done as we would have done this time last year," said Kevin Walsh by way of mitigation. "There's a few reasons for that, injuries, colleges and club maybe finishing a bit later, but either way our priority would be to try and keep guys a bit fresher than they were last year." Cillian McDaid, Galway's only really bright spark on the night, went off at half-time with what Walsh explained was a foot injury after scoring two points. And Walsh's only tactical innovation in a match that didn't take much decoding was the occasional deployment of Tom Flynn at full-forward. As it went, it was Dublin that scored two points from offensive marks despite the fact that they aren't currently using the experimental rule in training. Costello was well into his groove by the time Dean Rock scored the only goal of the night in the 57th minute and that finished the game as any sort of contest. "When the goal went in I have to say we wouldn't be happy that maybe defeat was accepted at that time," Walsh admitted. "Maybe fatigue kicked in a bit." For Gavin meanwhile, the intelligent leadership shown by Jonny Cooper and Brian Fenton were among the other major positives to take from a night that is unlikely to warrant any deep analysis this week. "It's our first competition of the season, we want to do well in it and we can only do well by getting the performances in games," he reasoned. "That's what we looked for tonight and in patches we got it." SCORERS - Dublin: D Rock 1-5 (0-2f); C Costello 0-6 (1m); P Mannion 0-2; S Bugler, N Scully (m) 0-1 each. Galway: C McDaid, P Cooke 0-2 each; J Heaney, S Walsh (f), B McHugh (f) 0-1 each.